Nick Saban and his Alabama Crimson Tide will open the season with a matchup against USC. 16 Alabama added another chapter to its dynasty with a 45-40 win over Clemson in the second College Football Playoff championship. The Crimson Tide collected its 16th overall national championship in dramatic fashion that included a game-changing onside kick in the fourth quarter. It is also the fourth title for Alabama in the last seven years under Nick Saban. The Crimson Tide is only the second team to win four titles in a seven-year span. Notre Dame accomplished the feat from 1943-1949. Saban added a fifth overall title to his legacy and joins Paul "Bear" Bryant as only coach to win at least five titles in the poll era since 1936. He needs one more title to tie Bryant’s six national championships he earned in his 25 seasons at Alabama. 31 The Horned Frogs rallied from 31-0 halftime deficit to defeat the Ducks 47-41 in triple overtime in the Alamo Bowl. It tied the largest comeback in any bowl game in FBS history, matching Texas Tech’s rally in the 2006 Insight Bowl. It also marked the largest comeback in TCU program’s history. Backup quarterback Bram Kohlhausen, who started his first and only game for TCU, led the attack with four all-purpose touchdowns, including the game-winner from eight yards out. 76 Virginia Tech and Tulsa combined for 76 points in the first half of the Independence Bowl, which set an NCAA bowl record. Most of the points came in the first quarter as the teams combined for a total of 45 points, 463 yards and 18 first downs in a quarter that took almost an hour to complete. The Hokies’ 45 points in first half were the most scored by a Frank Beamer team. Virginia Tech would go on to win 55-52 in Beamer’s final game with the program. 368 Christian McCaffrey put together one of the most impressive games in Rose Bowl history. The sophomore set a Rose Bowl record with his 368 all-purpose yards against Iowa. McCaffrey finished with 172 yards on 18 carries and 105 yards on four catches. He also returned a punt for 63 yards for a touchdown and added 28 yards on kickoffs. The Heisman runner-up became the first player to finish with at least 100 yards in both rushing and receiving in Rose Bowl history. With his remarkable numbers, McCaffrey also set a school single-season record with his 2,109 rushing yards. 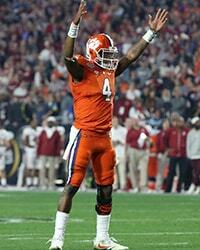 478 Deshaun Watson played one of the best games in his college career in the national championship loss to Alabama. The Tigers quarterback collected a career-high 478 all-purpose yards with 405 passing yards and four touchdowns. Watson broke the record for most yards in a title game, which was previously held by Texas quarterback Vince Young in the 2006 Rose Bowl. Watson also became the first player in NCAA history with 4,000 passing yards and 1,000 rushing yards in a single season. 645 Baylor set an NCAA bowl record with its 645 rushing yards in the 49-38 win over North Carolina in the Russell Athletic Bowl. The Bears blew away the previous record of 524 yards set by Nebraska in the 1996 Fiesta Bowl. Running back Johnny Jefferson led the attack for Baylor with his three touchdowns and 299 yards, which pushed his season total to exactly 1,000 yards. 3 Teams that entered with 5-7 records (San Jose State, Nebraska and Minnesota) won all three of their bowl games by 26 combined points. ... 4 Dak Prescott set a Belk Bowl record with four touchdowns and 380 yards. 5 Utah forced five BYU turnovers on the first five drives of the Las Vegas Bowl and converted all of them into touchdowns. ... Leonard Fournette set NCAA bowl record for most touchdowns from scrimmage with his five in Texas Bowl. ... 6 Jared Goff threw for six touchdowns and 467 yards in Armed Forces Bowl. He set Pac-12 single-season record in both categories. 9 SEC teams won more bowl games than any other conference the most bowl games. ... 24 Appalachian State scored 24 points in the fourth quarter, almost 3.5 times its game total from first three quarters, to win its first FBS bowl. ... 31 Joel Stave picked up his 31st career win as Wisconsin quarterback, the most in school history. ... Chad Kelly threw for four touchdowns to set Ole Miss single-season record with 31 touchdown passes. ... 33 Boise State held Northern Illinois to only 33 yards of total offense. It is the second lowest total allowed by any Broncos defense. ... 39 Tennessee’s 39-point rout of Northwestern was the largest bowl win in program history. ... 50 Clemson's win streak of 50 straight games with the lead going into the fourth was snapped by Alabama. ... 54 Duke broke the program’s 54-year bowl win drought with a dramatic finish in the Pinstripe Bowl over Indiana. ... 453 Louisville QB Lamar Jackson combined for 453 total yards (227 passing, 226 rushing), out gaining Cardinal’s opponent Texas A&M by eight yards. ... 950 Arizona State and West Virginia set a Cactus Bowl record with 950 passing yards combined.